If it says “No update available” when it finishes checking for an update, but you know you are not on the most recent version, you will now have the option of clicking on the blue “force update” button(s). Compare your current version of software with the most recent one available to know what needs to update. 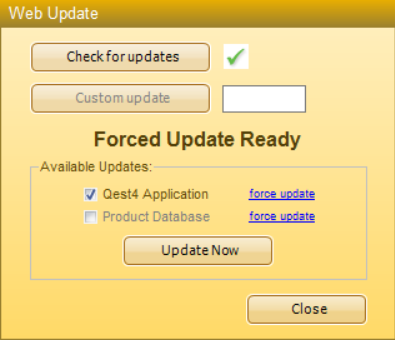 When you click on “force update” for “Product Database” it will bring up a box letting you know that this update takes longer so you can choose to update later if you don’t have time to do the update at that moment. Note: Some system issues can be caused by web updates not completing properly due to firewall interference. If any strange software issues occur shortly after updating your software, we suggest you try to complete the web update again. 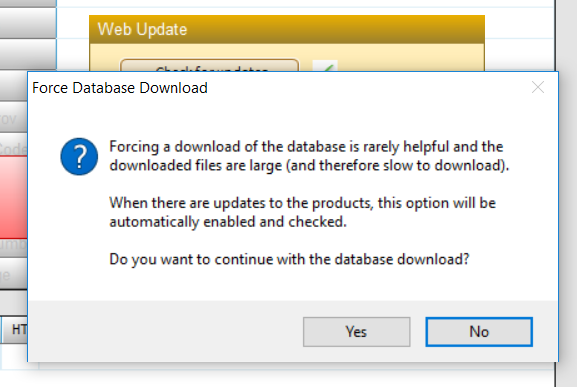 To do this you must force a complete web update.